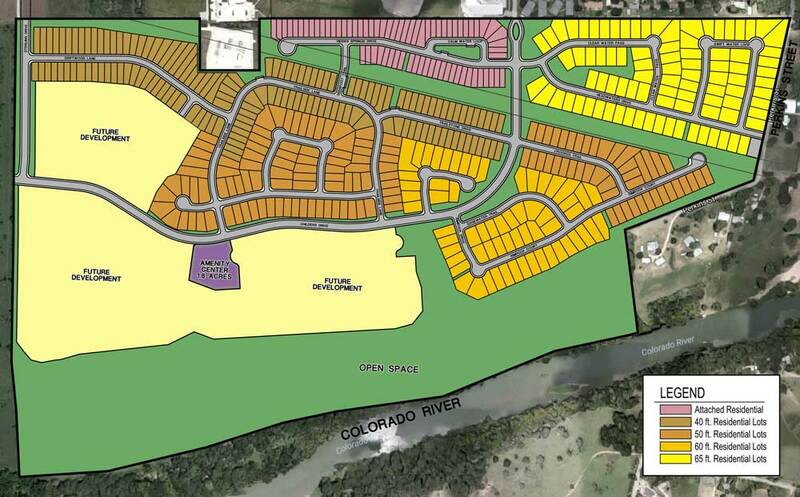 Pecan Park at River’s Bend is a 222± acre residential component nestled along the Colorado River, with excellent views, and a plethora of amenities that make this the premier new residential development in the Bastrop trade area. The design includes huge areas of greenbelt along the three-quarters of a mile of Colorado River frontage, and space set aside for a community amenity center. Lush landscaping and winding trails throughout the neighborhood will connect to community parks and link to roadways that lead directly to Historic Downtown Bastrop. All residential sections feature all city utilities. This residential component has the added benefit of providing a built-in consumer base for the businesses in the commercial section of Pecan Park.